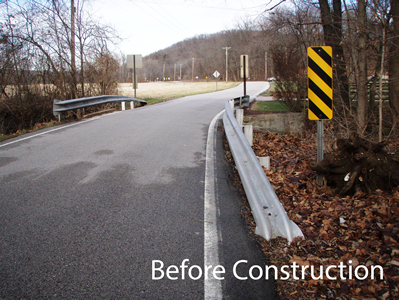 The City of Wildwood retained Intuition & Logic to design a new bridge or culvert to replace the existing substandard and undersized structure, 7' X 5', on Ossenfort Road. The new structure accommodates 11-foot lane widths and four foot wide improved shoulders. The existing bridge is in the Wild Horse Creek Floodplain over an unnamed tributary immediately upstream of the confluence with Wild Horse Creek. 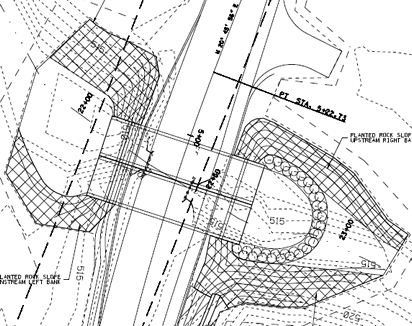 The final design included ROW, horizontal and vertical geometric changes to accommodate the new lane and shoulder widths, 42’ long double 10’X5’ reinforced concrete box culvert, modular bock retaining wall, drop structure upstream, vegetated channel erosion control, ROW plans, and traffic control. 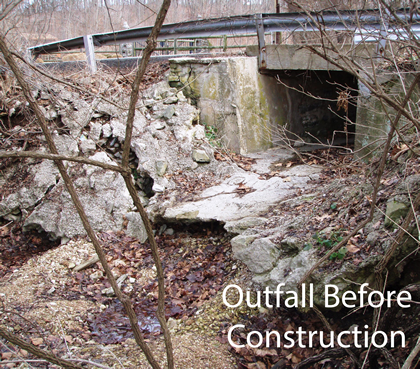 The tributary was stable in this location and the existing concrete bottom was acting as a grade control. Since the downstream end of the culvert was experiencing scour, the new double barrel 10’ X 5’ box culvert was lowered and a drop structure installed upstream. A stilling basin was also designed on the downstream side to dissipate the stream energy. Planted rock slope, vegetated with Missouri native plants and seeds, was utilized on the stream banks and disturbed areas. Roadway improvements consisted of tapering and widening the one-lane pavement at the existing box culvert to two 11-foot lanes with four foot wide shoulders. This section of Ossenfort Road runs parallel with and is in the floodway of Wild Horse Creek. A modular block retaining wall was utilized to accommodate the extra width of the roadway with minimal impact to the floodplain. All required permits were obtained by Intuition & Logic for the project, including a FEMA No-Rise.